Our brand new purpose built clinic is fully equipped and designed to provide treatment in a comfortable and caring environment. We offer a range of treatments from routine general check ups and hygiene visits, to complex specialist treatment including implants, cosmetic smile makeovers and treatment of gum disease. Our treatment rooms include the latest technology from digital radiography, Wand (Painless Computer Assisted Anesthesia) injections and the use of an operating microscope for specialist root canal treatment. 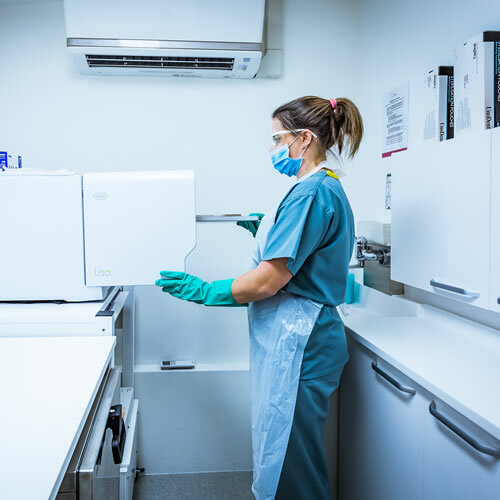 Dental instruments pass through our decontamination unit containing the most recent equipment. This enables us to adhere to the guidelines for ‘Best Practice’ as set by the Care Quality Commission (CQC), thus guaranteeing the highest possible level of cross-infection control.